AFC Rushden & Diamonds produced a second-half defensive masterclass as they picked up one of the more impressive results in their recent history with a 1-0 victory over King’s Lynn Town at Hayden Road. 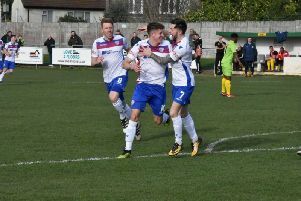 Having challenged his players to take the next step and beat one of the ‘big hitters’ in the Evo-Stik League South Premier Division Central, Andy Peaks got just what he was after as Diamonds boosted their play-off hopes with a determined display. The conditions were tough. The pitch was heavily sanded and cut up after passing a morning inspection while a biting breeze also made life hard for both teams. But Diamonds had the key to the success as the in-form Tom Lorraine grabbed his 20th goal of the season in all competitions and that was followed by an excellent defensive display as the Linnets dominated possession after the break. The first half was fairly open and played at a decent pace and it was the visitors who started brightly with Ben Heath having to make a good, low save to keep out Ryan Fryatt’s far-post header. Declan Rogers saw his ambitious 40-yard free-kick saved by Alexander Street at the second attempt but Diamonds went close to opening the scoring when a good break from right-back Zack Reynolds ended with him sending a shot narrowly wide with Street beaten. Adam Marriott dragged an effort off target at the other end and Street was equal to another Rogers free-kick, diving full length to his right to turn it round the post. But it was Diamonds who broke the deadlock six minutes before half-time when Lorraine latched onto a header forward by Joe Curtis and while the Linnets looked for an offside flag, the striker kept his composure to beat Street with a good finish. King’s Lynn were presented with a golden opportunity to level on the stroke of half-time when Heath completely misjudged Frazer Blake-Tracey’s corner and the ball landed at the feet of Michael Gash who could only fire narrowly wide. The visitors made a quick start after the break but the theme for the half was set early on. Diamonds kept their shape and stay disciplined. They allowed King’s Lynn to play in front of them but an end product was always lacking and, despite the visitors having at least 80 per cent of the possession in the second half, Heath didn’t have a save to make. That pretty much told the full story and the closest they came was just before the hour when a good piece of skill from Craig Parker created a shooting opportunity but the outstanding Alex Collard produced a terrific block in the nick of time. Collard and centre-half partner Liam Dolman marshalled the troops impressively as Diamonds saw things out without any late scares. This was the result that boss Peaks had been seeking after pushing the top sides in the division close in away matches earlier in the campaign. And if they maintain this sort of form on their own patch, it won’t be the last time one of the big hitters leaves Hayden Road empty-handed. Diamonds: Heath; Reynolds, Collard, Dolman, Ashton; Hicks, Curtis (sub Westwood, 58 mins); Diamond, Rogers, Farrell; Lorraine (sub Bowen, 86 mins). Subs not used: Dean, Acquaye, Johnson. King’s Lynn: Street; Fryatt, Robinson (sub Jarvis, 81 mins), McAuley, Blake-Tracey; Clunan, Richards; Mellors-Blair (sub Hawkins, 60 mins), Parker (sub Henderson, 60 mins), Marriott; Gash. Subs not used: Bastock, Kerins. Goal: Lorraine (39 mins, 1-0). Northants Telegraph man-of-the-match: Alex Collard - as observed in the report, the second half was a defensive masterclass from Diamonds and Collard was at the heart of it. While we have come to expect the sort of display Liam Dolman produced at centre-half, Collard has enjoyed a quick progression since arriving at Hayden Road. And he took it to a new level on this occasion. He headed and kicked everything in sight. Yes, there was the odd slip but there was also the small matter of a superb goal-saving block to deny Craig Parker just before the hour mark. Collard demonstrated everything you want from a defender. He was disciplined and brave and made a huge contribution to a fine victory.